No matter what level of riding you are doing it’s important to have an independent seat. Not only for safety but also for effect-ability of your aids. This seat moves with the horse and transfers a huge amount of force through the rider’s body. 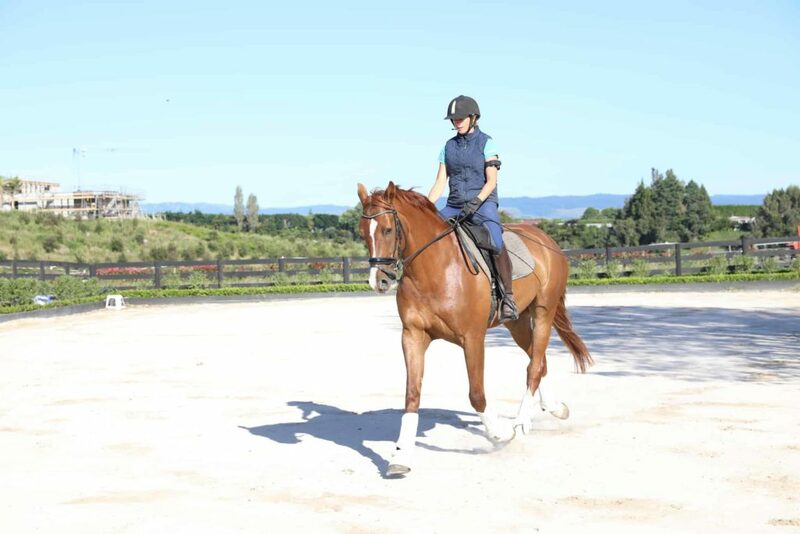 If the rider’s seat doesn’t swing, lift or move freely it can hold back the horse’s movement. This incredible movement looks like stillness to the naked eye, when in fact it is a combination of mobility, suppleness, and strength. An independent seat is a beautiful combination of both stability and suppleness. There are points in your body that involve incredible strength while other parts involve swinging and suppleness. Our joints aren’t the stability points, in fact, your hip sockets, shoulders and elbows must have mobility. This mobility matches the movement and rhythm of the horse that gives the illusion of stillness. Without this mobility, we flop, bounce and or stiffen up on the horse. This then translates to a stiff horse beneath us that can’t move freely through there back. So with all that being said it is important that you not only work on your strength but also your mobility. Here are some stretches to help you improve your hip mobility. Great for loosening up your glutes, ITB and can help with tight lower backs. Take a seat and bring one knee out in front bent with the other leg bent in behind you. Tuck in your front heel to your groan and lengthen your back leg so it becomes straight. Fall forward over right shin and rest hands or forehead on the mat. Option is to keep your back leg bent and the upper body upright. Hold for 10 deep breaths each side. Great for loosening up your hips and also helping to loosen up your glutes. Take a seat cross legged. Then place one of your feet on top of the other knee. Keep your foot flexed by pulling your toes back and gently let yourself lean forward. If its too much with the foot up, simply do this cross legged. Fall forward over right shin and rest hands on the floor in front. Awesome for loosening up your hip flexor muscles. Especially great for those who have a desk job. Kneel on the ground and step one foot out in front, so your knee is 90 degrees. Then reach behind and lift ankle up on the other food so you can take a hold of it. If you have the balance, take the same hand as the knee that is down up and reach to the sky. Squeeze your bottom and gently push into the stretch. Option is to place back foot up against a wall or leave it on the ground. Key is to feel this into your hips and the front of your thigh. Awesome for loosening up your deep hip flexor muscles and adductors. Start by kneeling on the ground and step one leg out in front. Then place your hands onto the ground and lower chest until you feel a stretch through your inner thigh. Stay on your hands or for more of a stretch come down onto your elbows. To begin with keep your back knee down on the ground. Awesome for loosening up your hip flexor muscles and improving overall hip range of motion and mobility. Set up as before, but this time turn your foot onto its side and gently push the knee wide. Use a chair for support if having your hand on the ground is to low for you. Great for helping improve mobility through lower back and lengthening problematic ITB. Lie on your back and bend both your knees up. Then let both knees drop over to one side. With your top leg straighten it until you feel a stretch through the outside of your leg and into your ITB. For more of a stretch reach to touch and hold toes. If this is to much, you can keep your leg bent. Our hips get incredibly tight throughout our day and having tight hips can have a huge impact on your riding posture. Take the time to stretch your hips and notice the huge change this can make to your balance and flexibility. Improve your fitness, strength and stability in the comfort of your living room. Yoga, mobility, HIIT and core workouts to help you become the best rider you can be. Start by downloading the free guide and get yourself started today.